Featuring a sterling silver composition with 24-karat gold plating, this ring takes the never-ending nature of a circle and uses it to proudly illustrate your family’s bond that can never be broken. Onto wave-inspired accents, you can engrave up to 6 names of Mom’s loved ones. For a look that will take her breath away on Mother’s Day, each name is beautifully highlighted with their corresponding cubic zirconia birthstone. 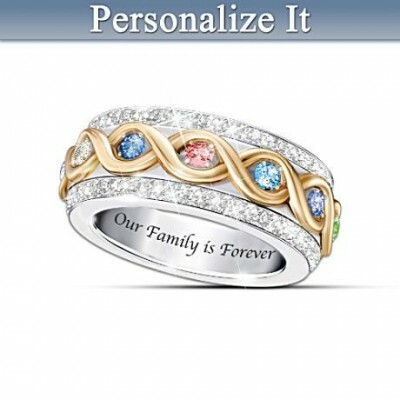 The unique design of this special ring surrounds Mom with her children’s love by placing her front and center. Mom or Grandma is represented by an impressive heart-shaped birthstone at the ring’s center. 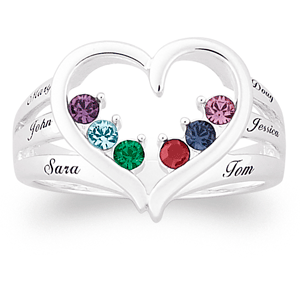 To symbolize her children, you can engrave up to 6 names along the sides next to their corresponding Austrian crystal birthstones. Crafted of sterling silver, the band’s design shows that in the heart of every child is a direct path to Mom. 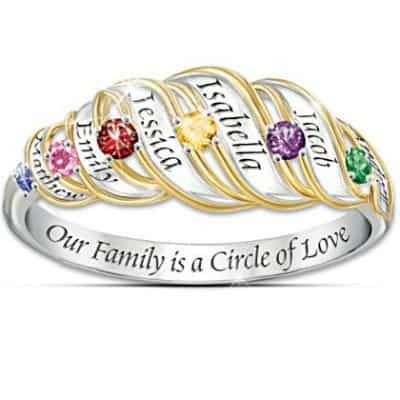 This fashionable design showcases each strand as its own unique entity, but they all work together to form the cherished family you know and love. 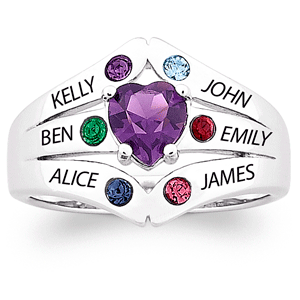 To represent your one-of-a-kind family, it includes up to 6 engraved names and their respective crystal birthstones. With a Certificate of Authenticity and a convenient gift box, this stunning ring is the perfect way to celebrate Mom on Mother’s Day 2017. This exquisite ring is crafted from solid sterling silver, but you have the option of plating it with warm and rich 18-karat gold. Its stunning design highlights up to 6 beloved names for a wearable reminder of her biggest blessings. To accent the engraved names, there is a path of sparkling genuine diamonds, which runs through the ring’s center, for an upscale look Mom will want to show off every day. Designed for the family that was sprouted in love, this gorgeous, growing ring is crafted in pure sterling silver and features up to 7 dazzling leaves, each engraved with a loved one’s name. Attached to each leaf design is a sparkling cubic zirconia birthstone that is highlighted with a clear crystal. This Mother’s Day, you can give her the gift of love at her fingertips with this one-of-a-kind piece. Beautifully plated in sterling silver, this moving ring features 2 bands of dazzling clear crystals that frame a spinning center band. For a thoughtful gift that will touch Mom’s heart, you can choose up to 6 birthstones, which are elegantly housed within a gold-toned infinity pattern. Thanks to its unique design, the spinning motion awards each unique birthstone the attention it deserves. With its simple sterling silver band and modest design, the birthstones on this elegant ring soak up the spotlight. You can choose up to 6 brilliantly cut birthstones to create a ring that highlights the true gems in Mom’s life. For a completely customizable gift, it is available in silver or gold and your choice of either Swarovski crystals or genuine gemstones. Incorporating the beautiful tones of both gold and silver, this ring is handcrafted from genuine sterling silver with 18-karat, gold-plated accents. Embracing the band are 2 strands filled with 12 dazzling white topaz gemstones. 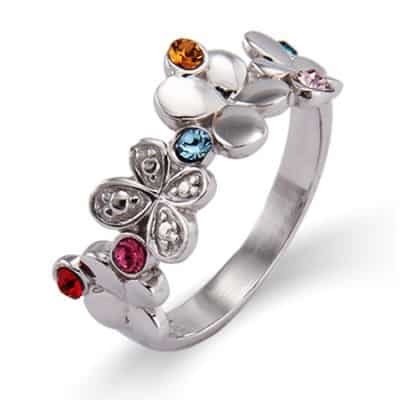 To symbolize Mom’s beloved family members, there are up to 6 genuine birthstones nestled in the center band. On Mother’s Day, she’ll love this gift that is both stunning and sentimental with each of her loved ones represented. On Mother’s Day, set Mom’s heart aflutter with this nature-inspired ring that 4 butterflies expertly crafted from sterling silver. One butterfly soars above the rest with its sparkling pave setting for added elegance. To personalize this piece, you can include up to 6 brilliant birthstones to help Mom carry her loved ones with her wherever she goes. With a radiant cluster of up to 6 heart-shaped birthstones at its center, this ring beautifully portrays how children are the core of their mother’s world. Each lustrous stone coordinates with the engraved name of a cherished child or other loved one. Set within solid sterling silver, the names and stones shine bright for a brilliant gift that Mom will want to share with all her friends. With its simple and understated design, this inexpensive Mother's Day ring keeps the spotlight on Mom while giving her a quiet reminder of those she loves. Crafted of quality sterling silver, it features a petite heart in its center that holds up to 7 Austrian crystal birthstones. For the Mom or Grandma who enjoys the simple things in life, this modest ring is the perfect Mother’s Day gift. Click here to see more Mother's Day rings for under $50. Composed of genuine sterling silver, this ring houses up to 6 engraved names for a custom-made gift Mom is sure to love. These treasured names are wrapped together by an infinity-inspired 18-karat, gold-plated accent, which reflects the infinite bond that unites them. Within this exquisite crystal-studded ribbon are the birthstones that correspond to each unique loved one. Crafted of sterling silver, this ring features a polished finish to create a shiny, sleek setting for the beautiful Marquise-cut birthstones. 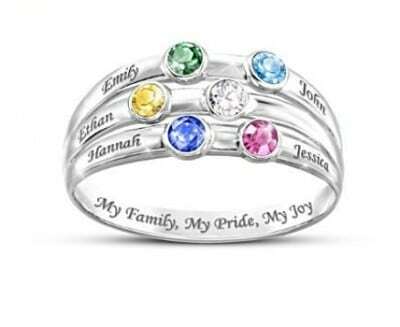 For a personalized Mother’s Day gift, you can choose up to 6 birthstones to represent her beloved children. As the Austrian crystals take center stage in this exquisite piece, their brilliance is supported by 2 strands of genuine diamonds for a look that will compliment Mom’s dazzling personality. As a great Mother’s Day gift, this ravishing ring features weaving vines of 10-karat gold. 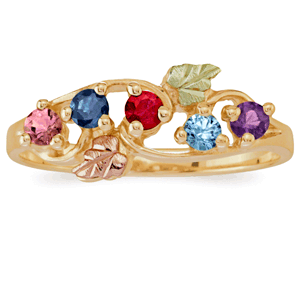 Gently perched among the vines are the fruits of her love represented by up to 6 genuine birthstones. To flatter the warm gold tones and shimmering stones, it includes subtle pink and green leaves for a polished look. This charming ring features a sterling silver composition and a polished finish for a surface that shines almost as brightly as the lovely lady that wears it. At the center where a mother’s heart belongs is a simple silver heart with engraved names flowing out of it. Lovingly sheltered within the open heart are up to 6 Austrian crystal birthstones to match the names elegantly etched on the sides. Perfect for Mom or Grandma, this gift will make this Mother’s Day an unforgettable one. Mother's Day rings were originally intended as a type of memorial jewelry. They were invented when someone took two wedding bands and enhanced them with the birthstones of the sons of the family. These early rings sold very well and have become some of the most popular gifts for mothers and grandmothers. 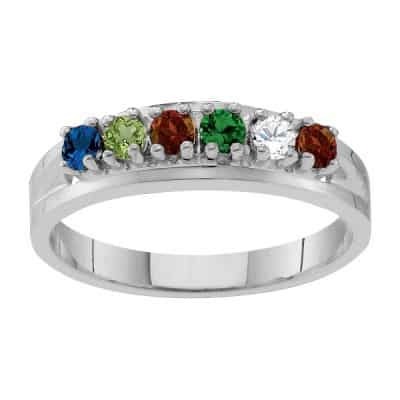 Today, of course, the mother’s day ring includes the birthstones of all of her children, not just the sons. 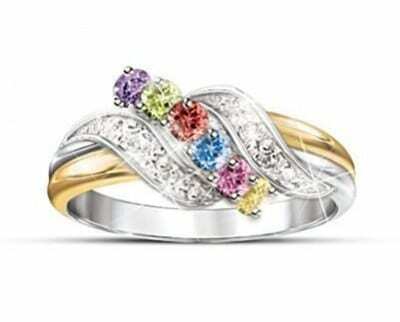 Some buyers prefer to add the birthstones of the mother and father as well. 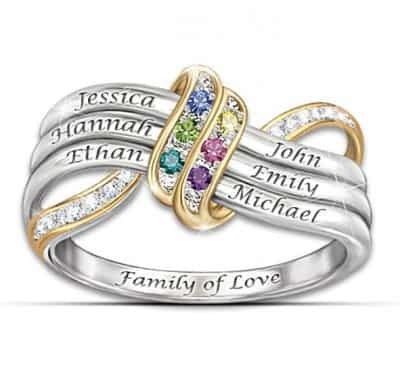 Many mother’s day rings include the option of adding the children’s names, which is becoming increasingly popular. Mother’s Day rings are some of the most sought-after gifts for moms and grandmoms. Obviously, Mother’s Day is the most popular time to give a mother’s ring, but the rings are also wonderful choices for Christmas, Hanukkah, birthdays, Valentine’s Day, and any other special day. 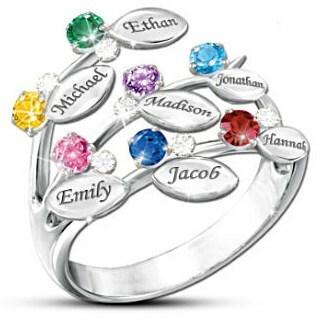 Birthstone rings for moms are always custom orders, since you have to specify exactly which birthstones and in what order they should be placed. Because of this, you should allow a little extra time when ordering. Some mother’s rings can be shipped in 2-3 weeks; however, 6-8 weeks is more standard. You should always check the supplier’s website to be sure.